There are two types of people in this world. Those that eat McDonald’s gherkins with reckless abandon and those that peer at their open burgers, fingertips poised like pincers ready to remove the offending article. Usually, those second type of people flick their gherkins (not a euphemism) in my direction. LOVE them. I can’t say the same for the scent of frankincense though. My mother boarded at convent school and can’t get enough of the pungent resin which is said to contain healing properties that promote the well-being of both the body and the soul. Neals Yard have based an entire collection on the aromatic resin and it’s at the very heart of their anti-ageing skincare range. I’ve been trialling the Neals Yard Rejuvenating Frankincense Facial Serum for the last 4 weeks and scent-aside, it’s been an absolute pleasure to use. [stextbox id=”custom” caption=”Ingredients” ccolor=”ffffff” bcolor=”b0c4de” bgcolor=”e6e6fa”]Aqua (Water), Glycerin*, Sucrose distearate, Helianthus annuus (Sunflower) seed oil*, Centella asiatica (Gotu kola) extract*, Palmitoyl tripeptide-5, Vaccinium corymbosum (Blueberry) oil, Curcuma longa (Turmeric) root extract, Sodium hyaluronate, Boswellia carterii (Frankincense) oil, Citrus bergamia (Bergamot) peel oil expressed*, Citrus nobilis (Mandarin) peel oil expressed*, Tocopherol, Xanthan gum, Cetyl alcohol, Sucrose stearate, Levulinic acid, Potassium sorbate, Citral, Citronellol, Limonene, Linalool. When I began to use the serum, I was looking forward to experiencing a continued reduction in redness (thanks to anti inflammatory ingredients such as Turmeric) and whilst I can’t say that my skin tone has improved further… I’m definitely not suffering from any increased redness despite external factors that would usually cause me problems. The central heating has gone on since I’ve started using this serum and temperatures outside have dropped considerably. On this count, I’m impressed. It’s November now and I’d also usually be doing daily battle with dryness… I have a few drops of my Dr. Hauschka Rose Day Cream left but I’m not having to use it. So far (touch wood), my skin… which would normally be parched above my eyebrows, under my eyes and around my mouth… is completely normal. Can I put this solely down to the serum? No, my moisturiser isn’t the same as last year and neither is my diet. There are too many other factors that could be influencing my skin but my gut instinct is telling me that the immediate moisture boost I can feel this giving my skin is definitely helping to keep my skin hydrated day in and day out. 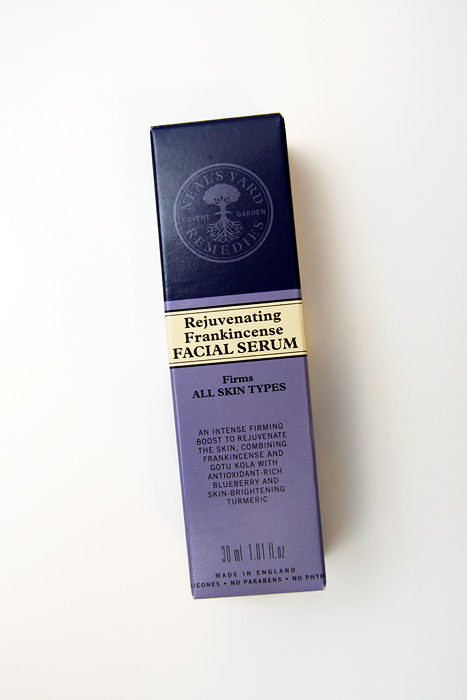 Above all else, Neals Yard Rejuvenating Frankincense Facial Serum is a joy to use. A thin, slightly oily cream that melts into my skin immediately hydrating and softening. It leaves a non-greasy base that welcomes my night cream without demanding it. After washing my face, I pat my skin a couple of times to remove excess drips and apply this while my skin is still slightly damp… I find that this is key to squeezing the full benefits from the product and makes all the difference to how soft and hydrated my skin feels after application. At £39.50 for 30ml, it’s not an inexpensive product though it spreads so well (especially on damp skin) that I could probably eke out daily usage for an minimum of three months. 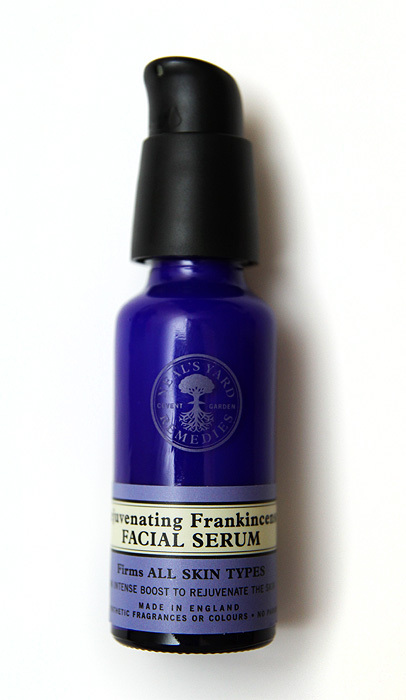 Neals Yard Rejuvenating Frankincense Facial Serum is available to buy online or instore at Neals Yard. Does the smell stick around after application? Either way this stuff sounds fabulous. I’m a sucker for a serum. Hey, I love pickles! Almost thought I was the only person on earth who ate the pickle first…people pass me theirs by default My parents always give me theirs :). Yey something random in common! I love sour preserves, vinaigrettes… yikes my mouth’s watering…sorry the comment has nothing to do with the product post. LOL! Lol, I love the start of your post, about gherkins! I love them too – my hubby always picks them out (with a sneer of disgust on his face) and puts them in mine! Eh yum to gherkins and yum to this, looks fab……I can just imagine the gorgeous smell…. It sounds lovely and so do the gherkins!